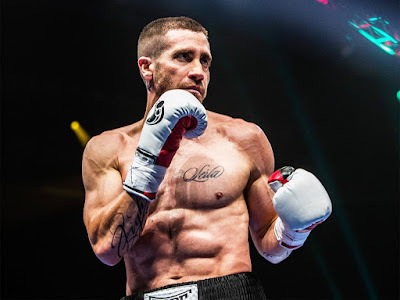 SOUTHPAW is an earnest but risibly cliched and over-acted boxing drama written by Kurt Sutter (SONS OF ANARCHY) and directed by Antoine Fuqua (TRAINING DAY). The movie starts Jake Gyllenhaal in a typically intense, hyper-realistic portrayal of a working-class kid turned successful boxing champion. He's married to the love of his life (Rachel McAdams) and has a young daughter which is all so far so ROCKY. But pretty soon, his wife is caught up in a shooting and dies in one of those over-scored over-dramatic moments that will serve as the lynchpin for the rest of the film, in which our broken hero tries to resurrect his career and win back his daughter from the evil social services. His flashy manager (50 Cent - actually ok as an actor) having left him, our hero winds up begging a wizened old boxing manager played by Forrest Whitaker to train him. Because as in ROCKY, the best training is low-rent, austere hard work on the worn-out mats of a back-street gym. The resulting film is basically unwatchable despite Gyllenhaal's impressive physical transformation and the beautifully edited kinetic fight scenes. The characters are so two-dimensional and their actions so predictable as to render the movie a paint-by-numbers exercise. As such it's a remarkable waste of the talents involved. SOUTHPAW has a running time of 124 minutes and is rated R. The movie was released in summer 2015 and is now available to rent and own.